It works by wrapping all the methods in the given context and keeping track of the number of times they run, how much memory they consume and how long they take to execute. 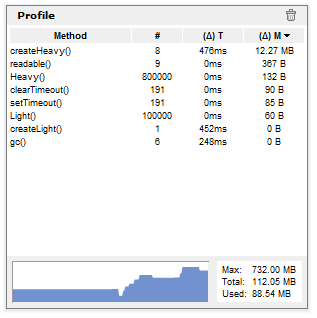 The results can be viewed real time in a small overlay or you can track specific methods and see the output in the console. Unfortunately it only works in Google Chrome since Chrome exposes the memory information.